The palaestra trench has now been completely cleaned. We are ready to context and draw the area, which is being dug by Sebastian Matz, assisted by Judith Wolf and their team. 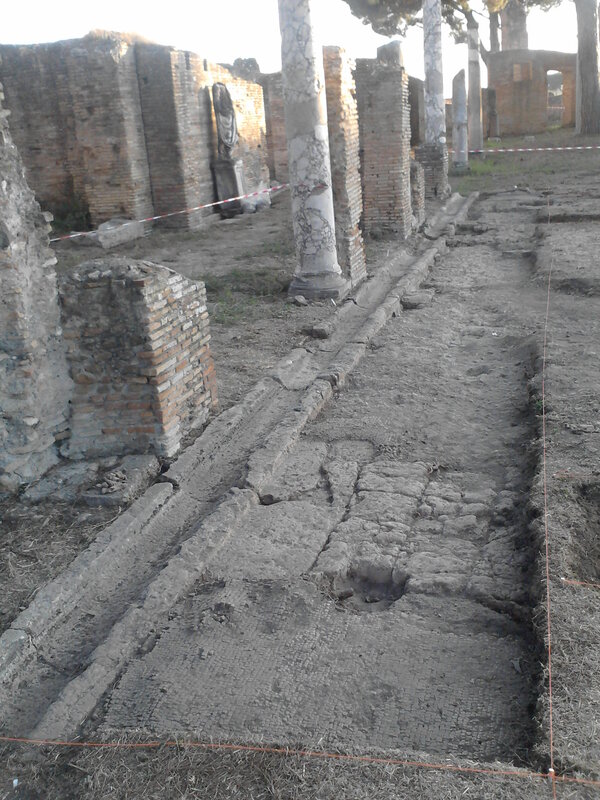 The excavation has revealed a phase of travertine paving for the palaestra, previously unknown, which was replaced by an extensive black and white mosaic right across the square, sometime in the 3rd or 4th c. This mosaic significantly left room for a number of large structures, now lost, which stood against the portico columns. We anticipate that these were perhaps basins, from associated holes in the paving which seem to pass into a drain below. There is not much further archaeology in the trench, although we did find a 3rd c. layer in a previous test pit in this area, lying over a layer of tufa bedding which may be part of a foundation layer of the mosaic. It seems unlikely that the square was robbed as early as this, given the surrounding sequence of walls. These walls we are currently recording, having benefitted from the keen eye of professor Janet Delaine (Oxford) yesterday, across the whole site, and observations from her student Jennifer on the mortar layers between bricks. With such guidance, Aiofe and Irene, who are contexting the walls, will be able to provide a much stronger documentation. A few scattered post holes suggest the post-classical occupation that we know existed elsewhere in the square. Further digging may tell us what they are.